Almost twenty years ago, writing in praise of Quentin Tarantino’s “Pulp Fiction” for Premiere magazine, author Rick Moody said that “the first and most important act of violence” Tarantino’s movie committed “was against Robert McKee’s airtight three-act cinematic structure,” going on to describe the movie’s shape as “dangerously impulsive.” There’s always been a method to Tarantino’s impulsiveness, as it were, and seven films after “Pulp Fiction” his method is, if not exhausted—very few screenwriters and/or directors can successfully replicate the effects his best films achieve—then at least familiar. His screenplays purposefully juggle time, showing us a certain series of events in an independent context, then doubling back in time to reveal why everything the viewer thought he or she knew was wrong, while also providing bonus pleasures like bringing favorite characters back from the dead, in a manner of speaking. Tarantino is not the only filmmaker to do this sort of thing but he’s one of the few who do it from the ground up, that is, in the writing—masterful cinematic time-jugglers like Resnais, Lester, and Soderbergh achieve their effects mostly via editing. This is arguably a long-winded way to introduce a HEAVILY Tarantino-influenced film that tries to outdo Tarantino in the structural ingenuity department. The movie doesn’t even come close to succeeding, and teeters on the brink of out-and-out disaster at several junctures. But as failures go, it’s more interesting than most. 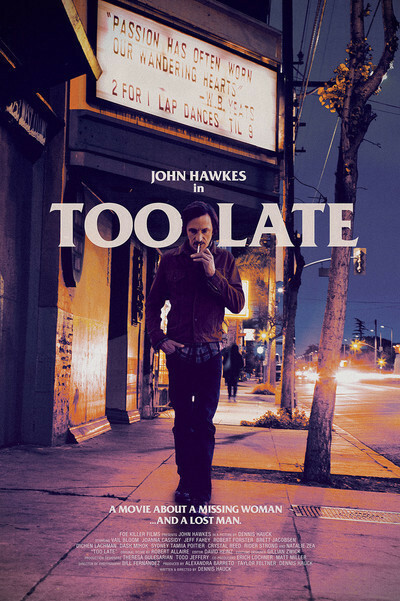 John Hawkes plays Sampson, an L.A. private detective with a rogueish-but-fatalistic air about him, who inexplicably comes running when he gets a phone call from a stripper named Dorothy (Crystal Reed). One says “inexplicably” because according to their conversation, they’ve only met once, and it was three years prior. One hopes to not being spoilerish when noting that the movie’s main title card, the one reading “Too Late,” appears about twenty-two minutes into the film, at the conclusion of its first episode, which is also its first shot. You read that correctly. “Too Late” is divided into five acts, each of which takes place in the space of one shot. More or less. (We’ll get to that qualification in a second.) To make matters more interesting, the five acts are non-chronological. The second act, in which a strip-club owner’s indignant and hurt wife is so beside herself that she answers the door to her house naked from the waist down, takes place after the first, but not directly; it’s Hawkes’ Sampson at the door, and he’s dressed in the same suit, but he’s pretty bloodied up, which he was not when the first act ended. Act three goes back those aforementioned three years, whaddya know. And so on. The ever-fantastic Hawkes does a great job evoking a character who’s four-fifths Philip Marlowe and one-fifth Jeff Lebowski; Hawkes, Dichen Lachman as a seen-it-all stripper, and to a certain extent Reed, are the movie’s performing highlights. However. There are a lot of “buts” here. Writer/director Dennis Hauck’s self-consciously Tarantino-esque dialogue is not only too-often film-schoolish, it’s too often self-referentially comparative-lit-ish as well, and that’s not a good thing. And while cinematographer Bill Fernandez does a great job in getting a very ‘70s-exploitation-cinema-evoking color palette onto 35mm here, the effort expended to keep each act confined to single shot yields very labored results. Not just in shooting, which is, in the first-act, obliged to pan-and-zoom to ridiculous lengths. And for all that, Hauck had to commit a lot of unforced errors in staging to keep the action coherent, including putting one character up a tree for not really a good reason. And even after bending over backwards, he’s still obliged to use split-screen at some points. You’re thinking, “Good lord, man, give yourself a break—just make a cut!” Further, a poolside scene in which Hawkes confronts some villains is dominated by whip pans that can’t keep up with the characters’ mouthing off at each other. Not unrelated: There are at least a half dozen instances in the film when actors rush, or out-and-out fluff their dialogue, take a self-conscious swallow, and then go on, clearly because they’d been directed to do so. (Anyone involved with the film’s making who talked themselves into believing the goofs could be interpreted as “naturalistic” was ill-advised to drink THAT Kool Aid.) I commend Hauck for getting out there and making the movie that he was clearly passionate about making. But that very movie could have used, if I may be so bold, two or three more passes on the script, a whole lot more rehearsal time, and a shooting schedule that allowed everyone the breathing room to get things right.